Delightful clumping evergreen groundcover. The mid green long narrow arching leaves form dense clumps. Spikes of light blue flowers in summer. Excellent as a garden edging or on mass. 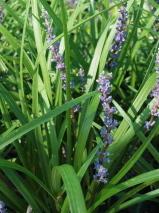 It prefers a shady site and is very drought tolerant. Hardy to frost. Prefers a semi-shaded site / Tolerates exposed sites. / Will tolerate very hard frosts.